To celebrate the start of St Christopher’s 50th Anniversary year, the Sydenham hospice created two magnificent floats to take part for the first time in London’s New Year’s Day parade on Sunday 1 January 2017. St Christopher’s was the only hospice at the parade and the occasion was especially memorable because members of the hospice’s Young Adults Group made a very special journey to central London to take part. 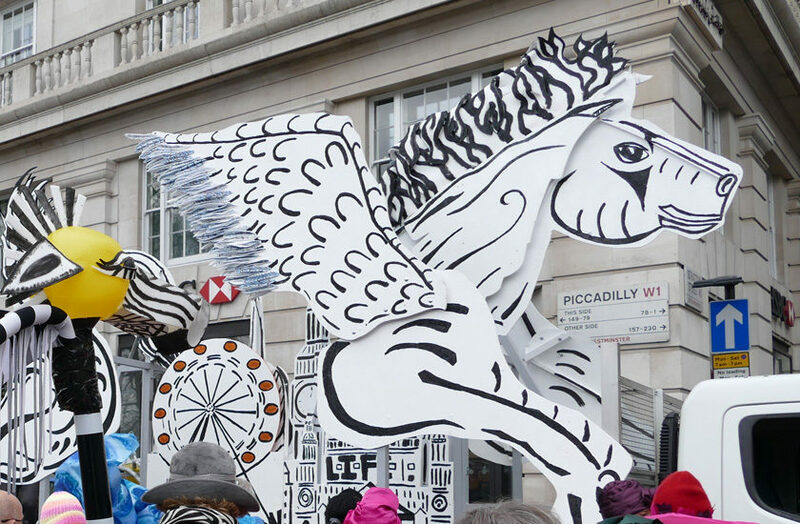 Adding the icing on the cake, the hospice was awarded second prize (out of the 17 London Boroughs who entered floats for the parade) for the ‘Pegasus and the Circle of Life’ design that it created to represent the Borough of Lambeth, earning the charity £9,000. The hospice’s second float, which represented the Borough of Bromley with the theme ‘Screen Stars & Hospice Heroes’, won ninth prize, earning an additional £2,000 for the hospice. St Christopher’s two floats represented the Boroughs of Bromley and Lambeth as they are two of the five London Boroughs where St Christopher’s supports patients and their families and carers at the end of life. Both the parade floats, the puppets and costumes were lovingly created by patients, staff, supporters and volunteers at the hospice in Sydenham and its Bromley site at Caritas House in Orpington. Phillipa Sellar, Nurse Specialist for St Christopher’s Young Adults Group, continues, “What made the day extra special was that everyone in our Young Adults Group contributed something to making or designing the float, for example, personal messages and wishes were painted onto decorative feathers on the float, so that even if many of our patients weren’t up to travelling to the parade, they could see the event on TV and feel special that they’d been part of it”. St Christopher’s Young Adults Group was established to support young people aged 17-25 living with a life-limiting condition in south east London. Because individuals in the group have very special needs, for the first time the parade organisers allowed two ambulances to wait with the floats before the parade set-off so that the group could be kept well and warm while waiting for the celebrations to begin. St Christopher’s 50th anniversary commemorates 50 years since Dame Cicely Saunders founded St Christopher’s in Sydenham as the first modern hospice, and by extension, marks the start of the modern hospice movement across the Great Britain and the world.